I can definitely quantify it. It's about 2x the cost of a similar non-PS version. Evocatively however, the difference is priceless! I’m sure I can find individual SE’s that are better than individual PS. Owning a Bernie Marsden has shown me that’s very possible. I’m sure I can find individual PS that are better than individual SE. The first task will take more tries than the second task. Everything else in between should fall in that continuum of probability, in a diminishing manner as you head up the curve. Diminishing does not mean zero. So it’s not that all PS are better. I’m sure there are average PS. There will not be bad ones due to the highest level of inspection - when your founder CEO personally handles and tests your work, that tends not to happen. But I should think the chances of finding a magic guitar would be higher. You still have to find it though. Maybe go pick out the most resonant woods and rap your knuckles sore, bringing a luthier friend along. LSchefman, WA Paul and 11top like this. Yep! I had my dealer tap on my Braz neck blanks which were sorted for my weight specs while I listened over the phone (killed me that I wasn’t able to make the trip in person due to my work schedule). One rang like a bell and is the neck on my guitar, the other was noticeably more muted. There are no guarantees in life, only probabilities. Those probabilities are significantly higher with the PS program. Rusty Chos and Tonart like this. I’m sure you ended up with a killer guitar. Is that the ocean mist glow SC? Many think tone tapping is hocus pocus. I for one think the actions of a thousand luthiers outweigh the opinions of a trillion internet speculators. I think it works. Oh I forgot their most important counter argument. All one thousand luthiers, from hobbyists to small boutiques to big manufacturers, are supposed to be colluding in using tone tapping to over charge us hapless customers. Oh I can’t beat that argument. They’re right, they’re right, I surrender..
WA Paul and alantig like this. Growls when I want it to, but cleans up beautifully as well. Split coils sounds great too. Piezo adds another layer. My version of the AL LP but blinged out PRS with full Braz neck and no dang FR trem which I never got along with. Now if only I could play like Alex! Not meant to be, but that’s ok.
Rusty Chos, veinbuster, AP515 and 5 others like this. I'm pretty sure you forgot an F in the OMG somewhere. WA Paul and Tonart like this. WA Paul and flux like this. My word, that thing is ridiculously stunning. That top looks like is has lightning or a plasma ball. I don’t usually name my guitars, unless there is something very obvious. That one would be called Brazilian Tesla. I certainly think woods matter. All you have to do is compare a core 509 (Mahogany/Maple body, Mahogany/Rosewood neck) with Wood Library 509 (Swamp Ash body, Maple neck) and listen to the difference. One, I think, suits the Humbucker LP whilst the other suits the SC 'Strat' type better. The traits you expect from the Core, the warmth from the Mahogany, is apparent in the SC's where as the SC's in the WL 509 have that bright snap that you would expect more from a strat. I think the Core suits those players that are are more Humbucker type players looking for the added versatility of SC's while the WL is more suited to Strat type players looking for the added versatility of HB's - I wouldn't be surprised if WL owners run their guitar predominately in SSS or HSS. As a fan of Steve Vai, I have watched many of his video's and he also believes in 'tone wood'. Several times, I have seen him talk about why Evo and Flo3 are his favourite guitars and tapped the body and neck to show how they both resonate with the same (or at least very similar) tone. He picks guitars based on how the neck and body resonate when hit and believes that the guitars that match the body and neck together tonally, makes for a better guitar. He also believes that he can hear that 'tone' (the tone of the tapped woods), underneath every note the guitar plays. I have a tendency to believe him too - someone who has a well developed ear and has transcribed Frank Zappa's music. Going back to PRS though, another 'easy' way to see the effect of Tone Wood is by comparing a 'Standard' to a 'Custom'. The Standard sound generally darker in comparison which has to be attributed to the lack of Maple on the body. Its the same with other all Mahogany guitars and the same models that have a Maple cap. These guitars, like the 509 example I mentioned above, all have the same PU's, same scale length, same nit and bridge, same tuners and frets too. Everything the String is in contact with as well as the same 'PU's' too so the difference has to be the woods and the fact that the 'difference' can be predicted and repeatable shows that the woods are effecting the sound. It does annoy me when the 'internet' people bring up guitars made of Perspex, plastic, metal and even cardboard. They obviously don't understand that any 'solid' material will resonate and make a 'noise' when hit. They vibrate the air which causes sound - you can 'amplify' your electric guitar by putting the headstock on the wall (or any solid object). Surely these people must know that guitars with exactly the same PU's,electronics, scale length, wood choice etc sound different - the ONLY difference being the slight variations in the woods. This is why I think Private Stock Guitars can be different to cores because of the different woods that can be selected. You can pick woods for their 'tonal' qualities or just aesthetic and depending on the woods used, will depend on its tonal quality - even if you select exactly the same PU's, electronics, scale length etc as the 'core' model. I do think though that the cost and/or the person having a personal connection to their PS does play a part in how they feel about their guitar. If you have personally selected everything and had that built for you, that makes it 'special' but I don't think it will play better (assuming you had it built and set-up the same as a core), sound 'better' is subjective but could sound different depending on the woods, and as for 'feel', that really depends on the finish and/or variations the person specced. 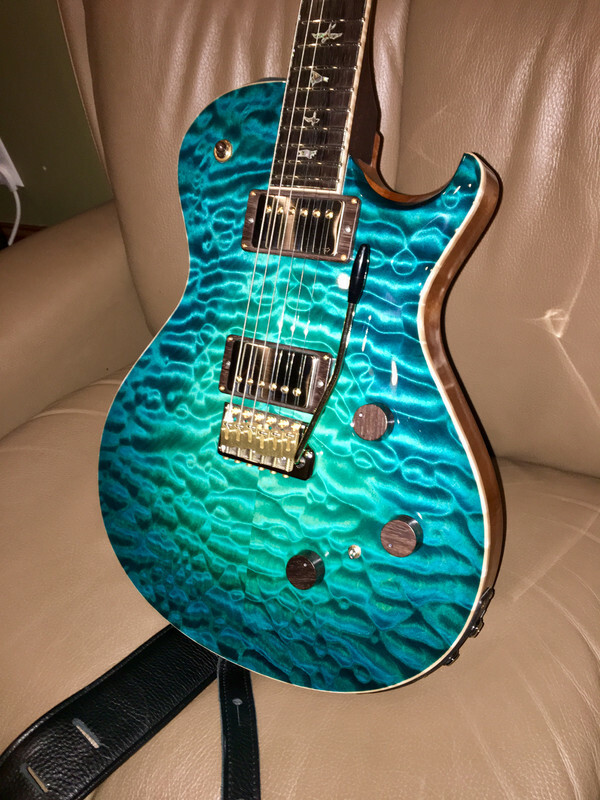 I won't argue that they 'look' better as the PS does have the finest Maple, more unique colours, bursts (just look at that glow burst above and the quilted maple), more unique woods, more options for inlays and inlay materials etc. You can't underestimate the power of visuals either and how that affects the player. If you don't like the look of something, that does make a difference to how you feel about it and the tone - maybe not with 'everyone' but certainly a lot of people. Anyway, that's getting a bit off-topic. If money was no object, I would certainly commission a Private Stock guitar (or 2). I already have specced my own PRS PS guitar(s) in my head but I am not irritated that I cannot and probably never will be in a position to realise those guitar dreams. When I was younger, the dream was to own a 'core' PRS and once that was realised, the dream is now to own my own PS guitars. Dancing Frog, Alan Manning and Tonart like this. Can you afford the power ashtrays? Do you need the power ashtrays? Do you need a 4-barrel carb engine? Headers? Rollbar? Nitro-afterburner? Exchange “ashtrays” for “8-track player” and “first gen Alpine CD head unit with Boston Acoustics power and speakers” and that could have been the ‘70s/‘80s for me! Well, nix the afterburner for a Roots blower. I totally get markd21’s comments. My perspective is completely from that of a player, putting the total vibe of the guitar first. That might explain all of my boring guitars, specially compared to most of you guys. It also speaks to my rotten luck finding the “player” guitar that is also the “looker”. It’s just how I’m wired. Now, don’t get me wrong...I have had my periods of blind disregard for budgetary restraint in my past, too. Performance cars are the slipperiest slope! In one month of unabashed track fun I could have bought a very good PS. In a “good” year that’s 12 PS builds. That’s also the eventual recipe for a divorce. Even if you have the green to burn, your obsession detracts from other important things in life. Now I feel like I’m at a support group meeting. Rusty Chos and markd21 like this. Sorry, but I respectfully disagree. PRS has its most talented people working in PS. Sure, with a PS you’re paying big bucks to get the fanciest materials, but you’re also getting the most skillful people building them with more time invested. I have to agree with Steve. I wouldn’t have thought so merely playing a few in a store, as opposed to in my studio, with my gear, for long enough to learn the nuances of the guitars and become acclimated to them. Now I have four; I don’t think I’d part with any of them, and here I’m not talking about looks, but tone and feel. They’re a little bit different from PRS’ Core models - of which I’ve had quite a good number, certainly enough of a sample size to come to a conclusion on the comparisons. I also had the Artist II, one of PRS’ precursors to what later became the PS approach (though the options were more limited and it had a thinner poly finish), and a number of other limited runs, like the Artist V and Sig Ltd. Please forgive me if this post seems long-winded. I have to live with a guitar for a while before I can come to more than the typical “triage” decision one reaches in a guitar store sifting through what’s on offer. Not long ago, I’d have said the difference between PS and Core amounts to the custom features and bling. I was incorrect. The tone’s a little different, too. I’ll concede that I’m making pretty fine distinctions here, however, there’s a subtle difference to both the tone and playability, and I think Steve nailed the reasons why, though I’d add that the nitro finish might be one reason for the tone thing, others might be the availability of interesting wood species. For example, my 3 PS electrics have Madagascar rosewood fretboards. They seem to have a characteristic and consistent thing they add to the sound. I also have BRW, and it sounds a little different from the Madagascar and IRW. It’s subtle, but it’s there. In general, the PS models seem to have a very rich, beautiful and lively tone that I find only comes with the higher priced spread. Again, it’s subtle. I had to live with it to truly understand it. I won’t say it’s “better” because that’s a subjective determination, but “different in a good way” works fine for me here. After a while I said I’d only play PS, but lately I’ve also bought a couple more Core models, and I love them, too. Sometimes the tone of a Core is just exactly what the doctor ordered. Rusty Chos, Alnus Rubra, Tonart and 2 others like this. In one month of unabashed track fun I could have bought a very good PS. Just alternate your obsession years; one year, the month of track fun, the next year, the PS. Thanks! Those ‘sparks’ really only show up under camera flash. 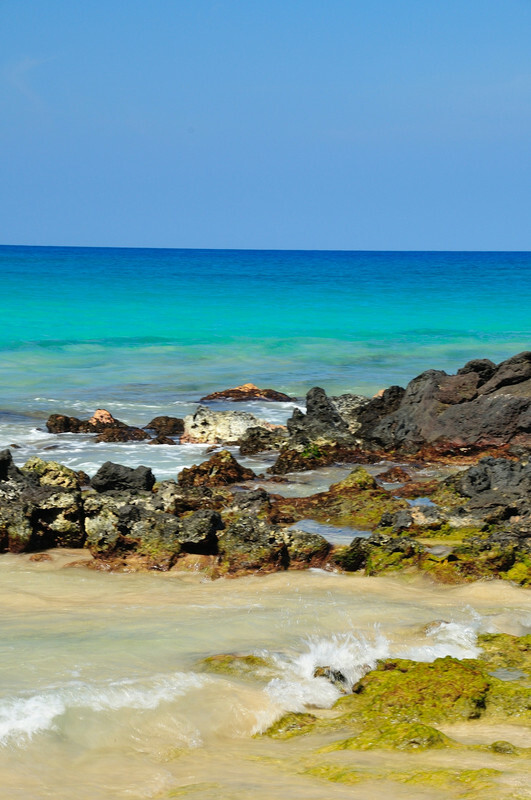 I call ‘her’ Miss Hapuna, since the Ocean Mist Glow color really nails the beautiful colors of Hapuna Beach on the Big Island of Hawaii, one of my family’s favorite vacation spots. Rusty Chos, Alnus Rubra, Tonart and 1 other person like this. Alnus Rubra, Tonart, LSchefman and 1 other person like this. That’s a one in a million guitar! A nine foot long gig bag’s kinda hard to find these days, too. Alnus Rubra, WA Paul and Tonart like this. LSchefman and Tonart like this. Well I can carry my guitar and play it.